High Quality 1000 Watt system Numark or Pioneer mixer with JBL, Berringer or Mackie speakers. Virtual Library On the spot music request, instant look up and any song played via virtual digital system. DJ Duals as MC Conducts professional announcements, entrances + various MC duties throughout the night. Coordinates Wedding formalities, with keenly timed music. 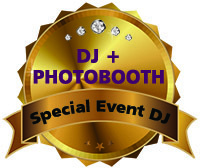 Open air or closed Photo Booth High quality Photo Booth with unlimited photo sessions for up to 5 hours. Double strip prints included (customisable with provided logo/event name). Wide variety of fun props included. Optional guest book with glue sticks included. 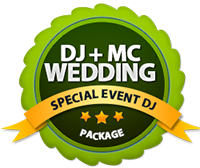 (DJ duals as MC) - DJ duals as MC, conducts professional announcements + entrances and coordinating chosen wedding formalities throughout the night. (For ceremonies onsite but farther than 200 meters from main system. 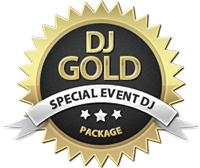 2nd independent system required) - up to 2 hours, pre ceremony music, microphone/lapel for priest, post cocktail music, and independent system set up and break down. (ea)for extra deep base sound. (for slide shows) - customer provides slide show. Ideal for weddings, birthday parties ‘memory’ slide shows. Also great for corporate holiday parties or presentation use. Projector Sound is connected into main speakers for premium sound. Must be position near main system towards blank white wall or pull down projector screen.